The lack of Southern-inspired restaurants in Vancouver is not surprising. First of all, our Northern location doesn't exactly scream out "bayou". Secondly, there are not many people immigrating from Louisiana to the GVRD. Lastly, due to our demographics, the dominant cuisine would of course be Asian. 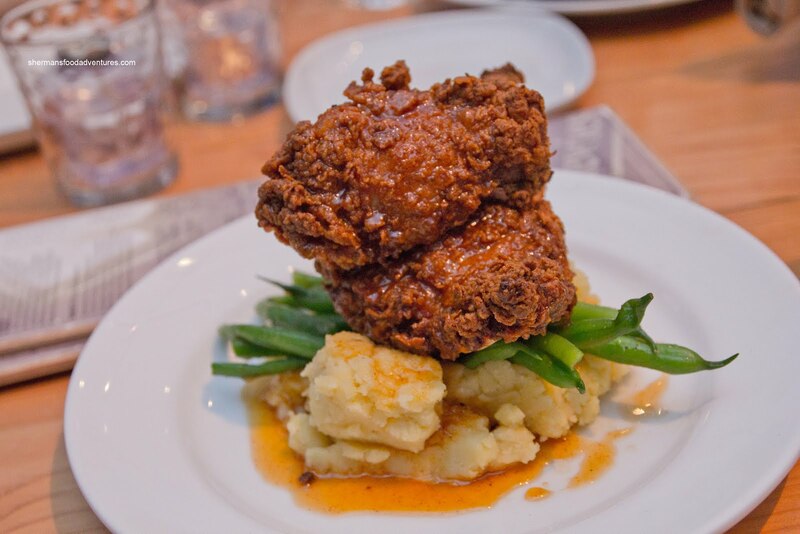 However, there are few places that try their best to serve up Southern cuisine. The last one we went to was a mitigated disaster (Crawfish King). Service withstanding, the food was not very good. That left a bad taste in our mouths literally and figuratively. It was especially disappointing for Hot Chocolate since she loves her Southern eats. In fact, she is our resident expert on the stuff. 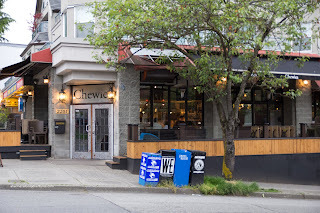 Therefore, our visit to Chewie's Steam & Oyster Bar was a redemption of sorts (to rid our memories of Crawfish King). It is worth noting that Crawfish King did attempt to reach out through a PR firm. I respectfully declined as this happened well after a month had transpired from that fateful meal. I give them credit for trying to rectify their problems. Once again, the meal was preceded by our Monday softball game which we lost handily. We were famished, but the search for parking spots and the eventual 30 minute wait for a table made us extra hungry. Hence, I ended up sharing a bunch of food with both Judes and Hot Chocolate. First up was the Buttermilk Biscuits with a Cajun honey butter drizzle. Although, on the menu, it stated herb butter which I'm pretty sure it wasn't. 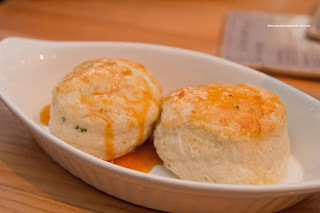 We were more than happy with the substitution because the sweet, spicy and sticky concoction really livened the biscuit. As for the biscuit itself, it was soft, warm and really satisfying. The same drizzle adorned the Southern Fried Chicken which I shared with Hot Chocolate. She sampled it first and all I could hear were sounds of delight (no, not that kinda sounds!). I finally got around to eating (after picture-taking) and yes, that fried chicken was fantastic. I got the white meat and it was succulent and juicy. The 2-day buttermilk marinade really shone. The outside was super crisp and remained adhered to the chicken until the last bite. Despite being mild-tasting, the chicken benefited from the drizzle which would not be out of place on some waffles. The freshly made mash potatoes (which we watched being made while waiting for our table) was chunky and rustic (not creamy nor over-processed) while the green beans were perfectly crisp. 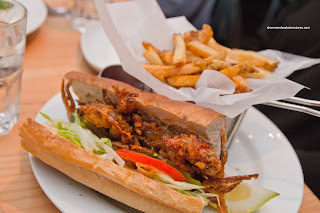 The second dish that I shared with Hot Chocolate was the Soft Shell Crab Po' Boy with lettuce tomato, pickle and Creole remoulade. There was plenty of fried crab in the sandwich, yet it was so fried, it was more like a crisp. We do realize that there is not much to a soft shell crab, but it did seem a bit too fried. Despite this, we still enjoyed the sandwich due in part to the airy baguette, fresh veggies, crunchy pickle (not too salty) and fantastic remoulade (a good hit of spice). The accompanying Kennebec fries were good being crispy and lightly seasoned. Just for curiosity's sake, I got a side of Fried Okra as well. 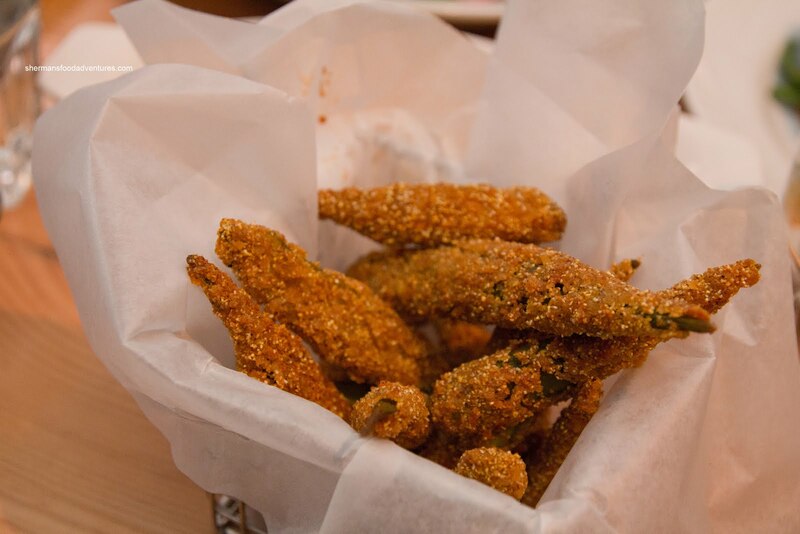 These were coated with crunchy cornmeal which stayed intact on each and every piece of okra. Naturally, the okra was a touch slimy (which is normal), however, the crunch from the exterior made up for it. The accompanying spicy Creole remoulade added a nice kick. 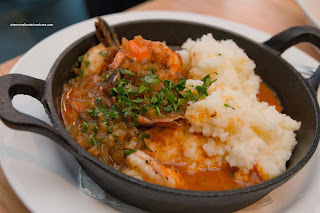 On the topic of kick, Judes had the BBQ Shrimp and Grits which was plenty spicy. It wasn't a burning tongue spicy though. Rather, it was a slow rumble which really added a lot of flavour. The shrimp were really large and cooked perfectly. They exhibited the requisite snap and tasted darn good (in a shrimpy kinda of way, if that makes sense). As for the grits, there was lots of texture, which I know some people prefer. For myself, I would've liked it to be a touch smoother. The spice level was exactly the same with the Gumbo consisting of shrimp, chicken and andouille sausage. The flavours were rich and the spiciness of the sausage added another layer of flavour. 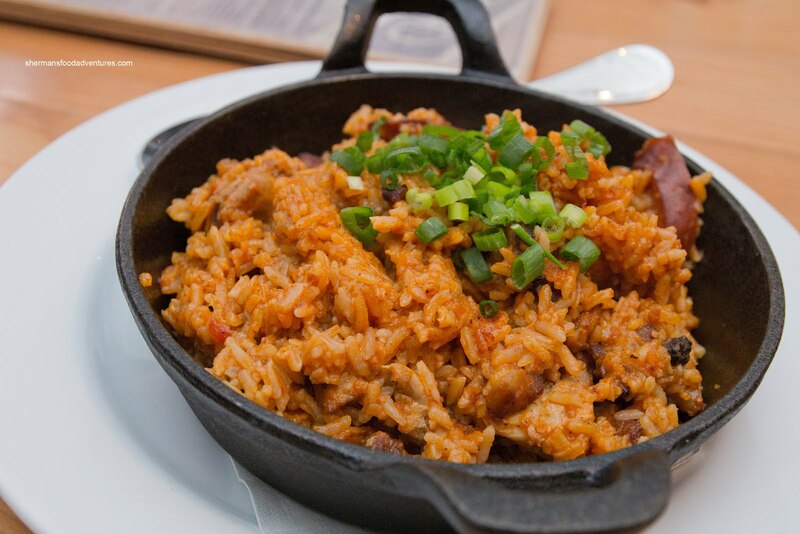 Milhouse and Boss Woman both had the Jambalaya, which was a fairly large portion served in a cast iron pan. Mixed in with the nicely cooked rice (retaining a nice bite) was house smoked chicken, andouille sausage, prawns and tasso ham. Once again, there was a good amount of spice from the Cajun seasonings in addition to the sausage and ham (more like spicy smoked pork). 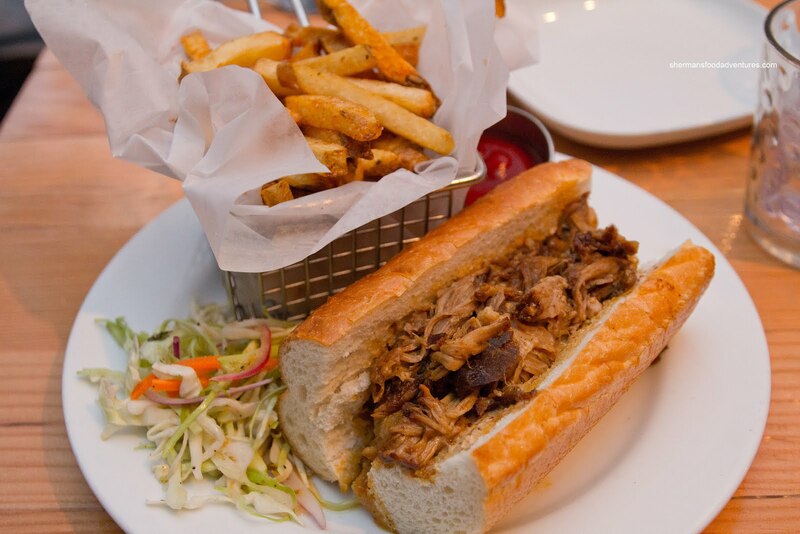 Bear opted for the Cochon de Lait (Pulled Pork Po' Boy) which was of a decent size. Nestled within the airy baguette was plenty of moist pulled pork which was mostly sweet (and not spicy). Although the meat was smoked, it didn't exhibit much smokiness. Bear thought it was a good sandwich at a reasonable price. 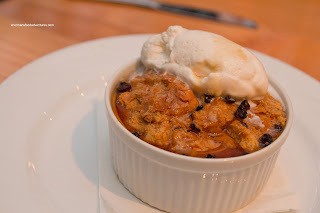 Being the dessert fiend that he is, he couldn't resist ordering the Caramel Custard Bread Pudding with black currents, brandy maple glaze and vanilla whip. Unlike many bread puddings which are too bread-like (I know, that sounds contradictory, but stay with me) and dense, this one was more pudding-like. This was to Bear's liking and mine as well. The brandy maple glaze was sweet without being overwhelmingly sugary. We loved the obvious brandy hint as well. This was a fitting end to a redemption meal. 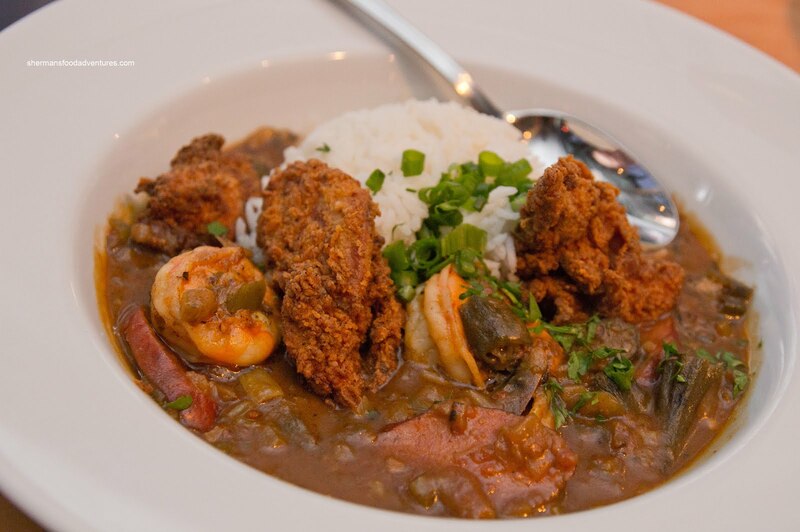 Good Southern food, which exorcised the demons of Crawfish King. What really made it legit was that Hot Chocolate went away already planning her return visit. I agree with your comments in regards to Crawfish King. I had the same experience there and it put me off completely. But there is a new restaurant called Cray Kitchen + Bar which I highly recommend. The atmosphere is great and I got really good service. Although they did mess up on one of our orders (it was Canada long weekend and the place was packed... It was also their opening weekend) we had our waitress and the manager apologize 3 times and my husband got a complimentary beer to compensate for the wait. I think you should check it out! @Mwu85 LOL... Believe me, I've been trying to convince my softball team to go to Cray Kitchen... They are psychologically not over Crawfish King.